Mixing sections, fresh air inlet and exhaust plenums consist of a modular section manufactured as previously described and are fitted with parallel or opposed blade multileaf dampers according to performance requirements. 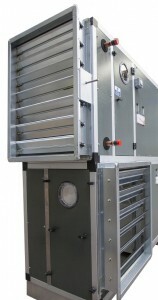 Damper blades and casings are constructed from folded 1.5mm gauge galvanised mild steel and assembled using purpose designed corner pieces and air sealed internally. Blades are formed from a single skin as standard and are secured in place by means of plated steel spindles running in maintenance-free nylon bearings. 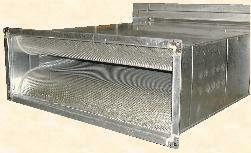 Blade edge and side seals would be fitted to dampers required to operate in low leakage applications. Damper operation will either be via hand quadrant for manual use or through extended drive spindles for powered actuator use. Actuators can be factory fitted if requested in advance by the customer at the enquiry processing stage. Fans are usually housed within a separate modular section as previously described and incorporate the designated fan & motor assembly. Belt driven centrifugal forward or backward curve fans, centrifugal direct drive fans and plug-fans are all available with the selection depending on the nature of the application, duty requirement, control requirement or the power source available. Belt driven centrifugal fan & motor assemblies are mounted on to a substantial all-welded support frame fitted with motor slide rails and isolated from the unit casing by spring anti-vibration mountings and neo-glass flexible discharge connection. Backward aerofoil blade or forward curved impeller selections are available to suit the volume – pressure characteristics required. Fan impellers are fabricated from galvanised mild steel with a mild steel shaft and statically and dynamically balanced as a complete rotating assembly according to ISO 1940-1 and ISO 14694, grade 2,5. Impeller shafts are accurately trued and ground for fitting into precision ‘sealed-for-life’ deep groove ball bearings engineered for 20,000 hours minimum running life in accordance with ISO 281. Fan Scrolls are fabricated from galvanised sheet steel, lap jointed or welded and fitted with aerodynamically shaped inlet rings to give even air distribution over the full impeller width. 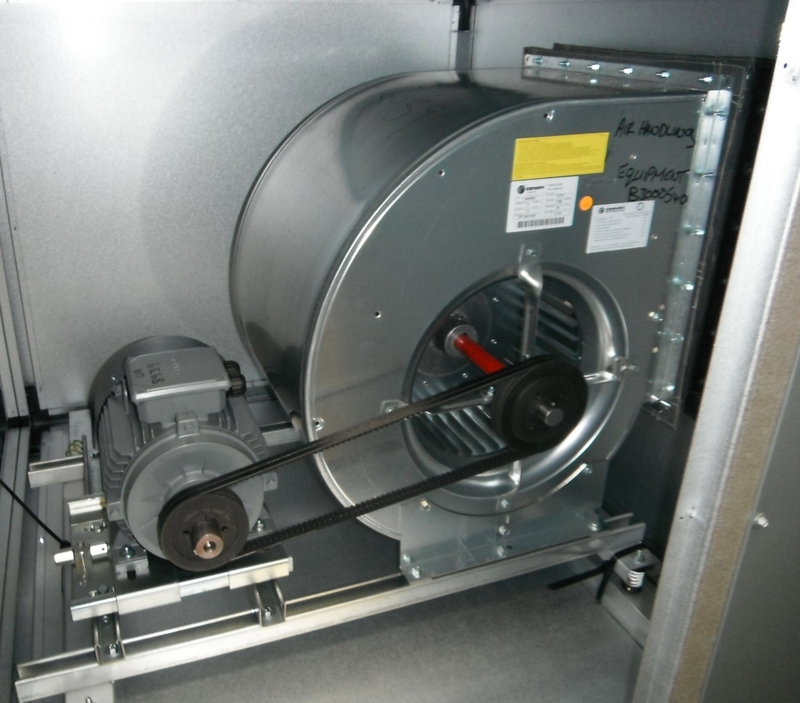 Motors are selected in accordance with current energy efficient directives and have totally enclosed fan ventilated cages to IP55 standard, wound with class ‘F’ insulation and suitable for 415 volt 3 phase 50 cycles electrical supply. Belt driven fan & motor assemblies are coupled using toothed belt drives conforming to BS1440 and guarded by virtue of the key lockable fan section access door. An additional internal drive guard can be fitted on request to enable safe entry within the fan section whilst the fan is in operation. 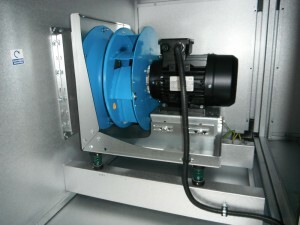 Plug-fans comprise of a single inlet backward curve impeller with matching inlet cone but without a conventional casing scroll and where the impeller is directly connected to the drive motor via a common shaft. Plug-fan performance is particular suitable for high performance plenum applications and being regulated by means of a frequency inverter. Plug-fan impellers comprise either backward inclined or aerofoil blades to suit the volumetric performance requirements. The whole plug-fan assembly is mounted onto a substantial all-welded support frame and isolated from the unit casing by spring anti-vibration mountings and fire retardant neo-glass flexible connection. Will be manufactured from galvanised mild steel casings incorporating die-formed single piece splitters with perforated metal faces and rounded noses Silencer providing bell mouth entrance and exit to air path. The Splitter infill comprises inorganic, inert, vermin and moisture proof mineral or glass fibre material of sufficient density to achieve acoustic performance. Silencers incorporated in Air Handling Units will be diaphragm mounted with standard modular casings, or can be supplied separately with mez flanges for duct mounting. Will comprise a self-generating electrode boiler unit providing continuous infinitely variable steam output of between 8% and 100% of full capacity. Proportional control is achieved by means of micro-processor programmed electronic switching of power to the boiler electrodes. Features standard to the humidifier comprise: water level sensing, drain pump, automatic adaption to mains water quality, automatic water (boiled) condition monitoring and an easy maintenance disposable type steam cylinder.